Willie Bourbon swings. The senior had five hits and three RBIs in NU’s weekend series against Maryland. If an objective viewer took one look at Northwestern’s offense from the three games played this weekend against Maryland at Miller Park, they’d likely guess that the Wildcats won the series, maybe even all three matchups. NU’s potent offense put up run totals of eight, 13 and 10, with hitters from all over the lineup pitching in with key hits. But offense was far from the story of this weekend, as the Cats (16-16, 5-4 Big Ten) dropped two of three decisions to the Terrapins (18-17, 5-4). Defensive miscues — including three walks and three errors in the final game of the series — halted a run which saw NU win nine of its last ten matchups. On Friday, the Cats battled back from a 9-1 deficit by scoring six runs in the fourth inning, keyed by freshman second baseman Shawn Goosenberg’s triple and junior third baseman Alex Erro’s run-scoring single. Despite the team eventually falling 13-7, coach Spencer Allen said his players exhibited abundant effort and tenacity in the comeback bid. On Saturday, the Cats played twice, as the game scheduled for Sunday was moved forward because of the inclement weather the day promised. 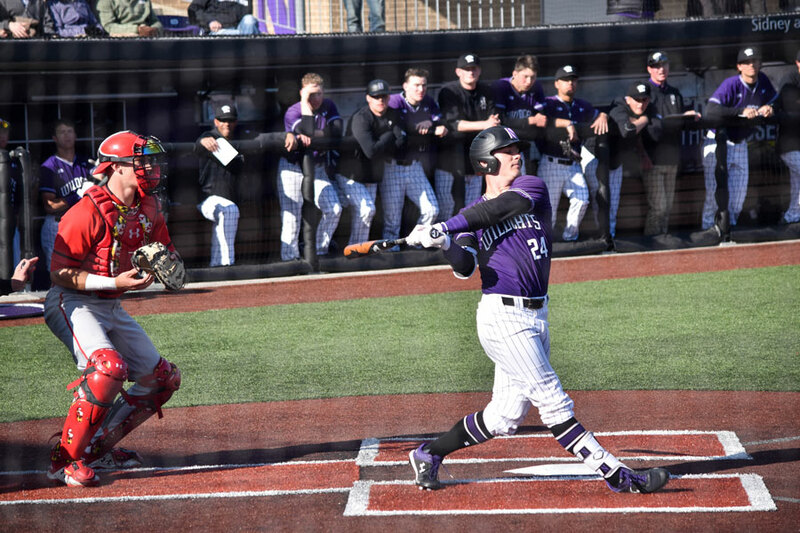 NU won the first matchup 13-8, receiving timely hitting from sophomore outfielder Casey O’Laughlin, who batted 2-for-3 on the night and recorded three RBIs. O’Laughlin’s triple to center field, which drove home two runners, was his first of the season and second of his career. Allen said O’Laughlin’s performance helped alleviate pressure off of the top of the lineup, pushing the Cats over the top. In the second game, NU dropped a closely contested 12-10 decision, in which the team failed to take advantage of elite offensive production, allowing three walks and three errors. Erro said when position players are struggling, it was incumbent upon the team’s hitters to come up with the offensive numbers for victories. For the most part, it has. The Cats put up 30 runs last weekend in a series sweep of Ohio State, and the team scored 11 on April 2 against Chicago State. Erro has been hot lately, too. Against Maryland, he hit 7-for-15 and recorded seven RBIs, including a three-run homer in the eighth inning of NU’s lone win in the series.